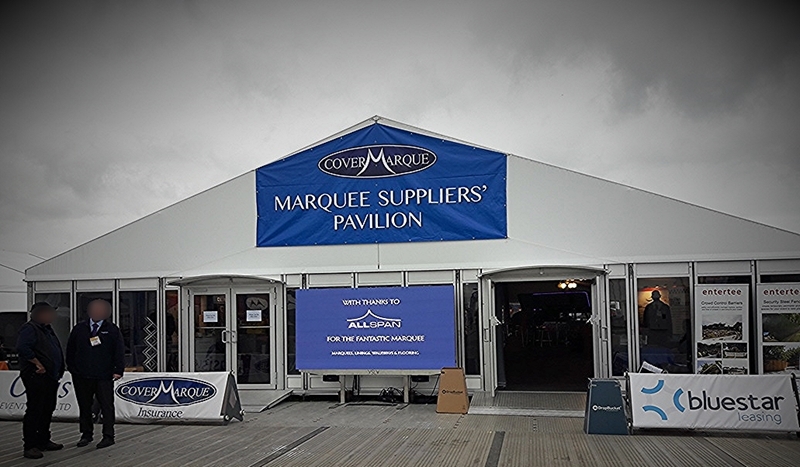 The Showman Show is the number one outdoor event exhibition in the UK and this year Allspan were asked to supply a 15m wide x 30m temporary structure for the CoverMarque Marquee Suppliers Pavilion. Each year, event industry professionals from across the country flock to the Newbury Showground for the biggest trade event of its kind. Specialising in just outdoor events, this exhibition is aimed at professionals involved in organising festivals, live events, trade shows, sporting events, garden parties and more. Among the vast array of displays, visitors can experience the event industry’s latest offerings and product launches, from the unusual and innovative to the latest high-tech kit and practical solutions. To give you a taste of the type of products on display this year, The Showman Show’s Twitter feed was dominated by human dinosaurs, smoking cocktails, electric shuttle vehicles, eco-generators, fair ground rides and lots more. It really is a versatile event and Allspan were delighted to provide this temporary event structure for the CoverMarque Marquee Supplier’s Pavilion, located at stand 128 in Avenue G.
The temporary event structure installed measured 15m wide x 30m and included a 15m wide x 6m Roof Only Canopy which was utilised as an outside seating area for coffee and drinks. Inside, the main structure provided substantial space for a wide range of exhibitors, including J&J Carter, Watkins Hire, Bluestar Leasing, C. Scope and Floorbox. Allspan’s team installed the Marquee Suppliers Pavillion in just 5 days before the event to give the exhibitors enough time to set-up their stands prior to the gates opening on Wednesday 17 October. The event structure featured a White Opaque PVC Roof and Walls, a levelled cassette floor finished with a grey anthracite needlecord carpet, glazed walling to the front 15m Gable End which included two glazed Emergency Exit/Entrance Doors. Internally, Allspan also installed Flat Ivory Roof and Wall Linings and overhead Globe Lighting. While Allspan was not an exhibitor at the event, fellow event professionals were able to witness how impressive our structures are and their versatility for all types of events. For instance, Allspan’s event structures and marquees have been utilised for similar exhibitions on many occasions, including Clerkenwell Design Week and the Works on Paper Fair at the Royal Geographic Society. Allspan structures are favoured by exhibition professionals because they can be located almost anywhere and styled internally and externally as required. To find out more about Allspan’s temporary event structures, please get in touch. We would be happy to discuss your needs and discover how we can support your exhibition or event.